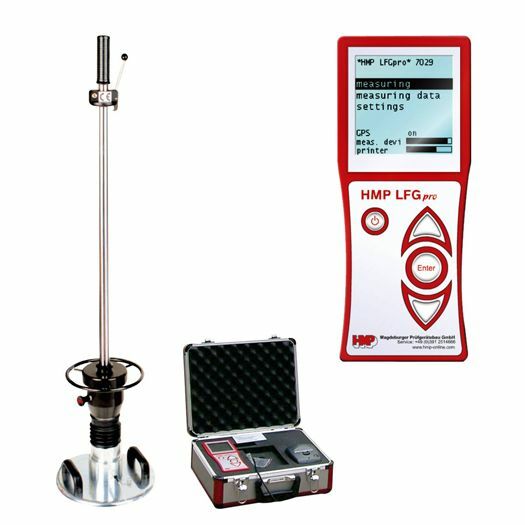 The HMP LFG PRO portable light drop weight tester also referred to as Light Weight Deflectometer or LWD is a dynamic plate load test that is used to determine the soil bearing capacity and compaction quality of soils and non-cohesive sub-bases, as well as for soil improvement applications. Built-in soil layers can easily be tested without load abutment, facilitating quick assessments of test lots even under limited space conditions. 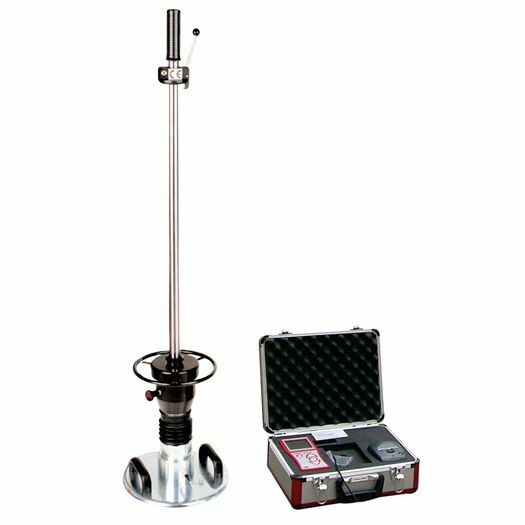 The test method is suited for coarse-grain and mixed grain soils having a maximum grain size of 63mm and can be used to determine the dynamic modulus of deformation of soil (resilience) in the range Evd = 15...70MN/m2. 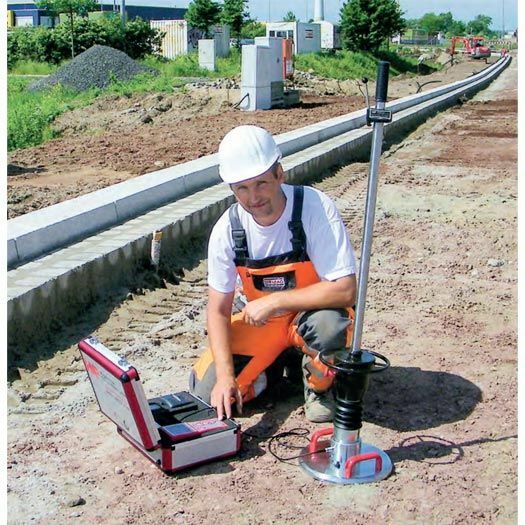 The equipment in conformance with the German Technical Test Standard for Soil and Rock In Road & Railway Construction TP BF-STB Part B 8.3/issue 2003, and conforms to the latest ASTM E2835 standards in relation to use of the equipment for measuring soil compaction quality or directly measure the EVD deformation modulus; The HMP LFG 4 provides measurements that have direct correlation to static load test (DIN18134, BS1377, ASTM D1194/1195/ 1196) & Procter test (Dpr)*. 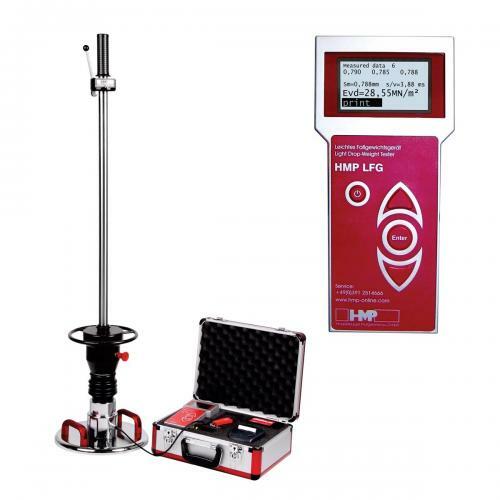 Provided with GPS for logging test locations, Large 16 line LCD display, Thermal Printer for On Site printing of test results, USB for data transfer, Software for data analysis and a Trolley Cart to allow easy transportation of equipment at site. Press (Power) to switch on the settlement measuring instrument. Perform 3 impacts in succession. The settlement value in mm is displayed after each impact. 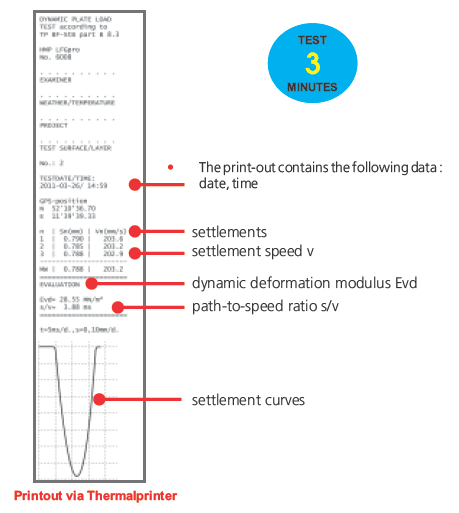 After completion of the test, the average settlement, the deformation modulus, the path to-speed ratio and the settlement curve are calculated. Settlement curves can be viewed on site itself. On Screen Display for show the caculation as well as graphs. 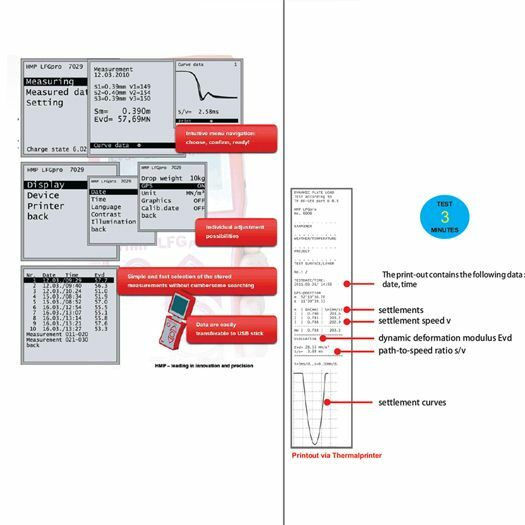 Printing of measured data from memory for documentation purposes at any time and in any place. Thermal printer is integrated with the LFG Pro unit in the protective case. 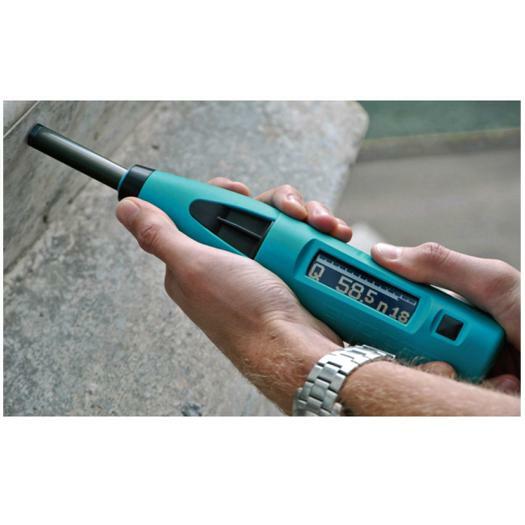 Instrument is also compatible with external GPS receiver (optional item). 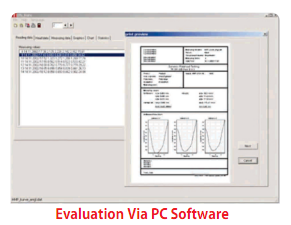 Series of measured data can be transferred to a PC for evaluation by software. Connect the PC to the settlement measuring instrument (or transfer data by USB stick). Evaluate, revise & archive measured valueson PC. Comfortable processing of the protocol by means of a special. Connect the provided USB cable to a free USB interface of the PC and the settlement measuring instrument. Switch on the settlement measuring instrument. 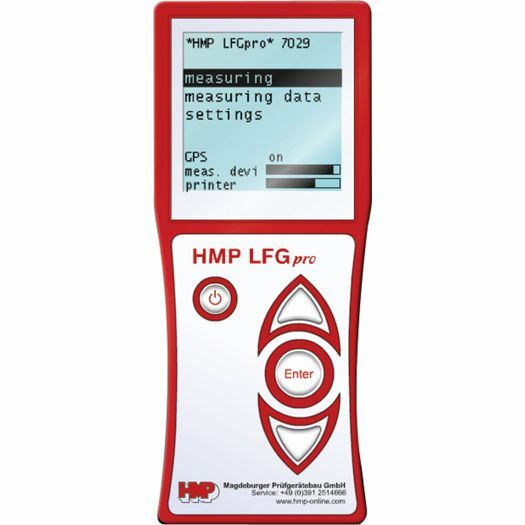 Select and acknowledge the transfer mode “device"
Select the register LFGpro reading. Select the appropriate removable medium and press Reading data button. The measured data will be transferred to PC. Connect the USB stick to a free USB interface of the PC. The USB stick appears on PC as a removable medium. On USB stick the measured data are stored in folders. 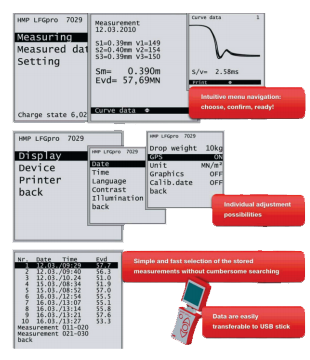 During each transfer of measured data from settlement measuring instrument to USB stick a new folder will be generated. The name of the folder contains date and time of the transfer time (format MMDDhhmm). All read in measured data can be stored in one data file by file - save us. It is also possible to store several measured series separate. So the measured series can be assigned to the projects. Mark the measured series of the project. Press the save particular data button. Select the directory, type into the file name (e.g. name of project) and click “OK”. After opening stored file (file- pen) additional measured series can be stored separate how described above. For deleting several measurements please mark these measurements and press delete button. Displaying of all stored data for this measurement point. Measur. 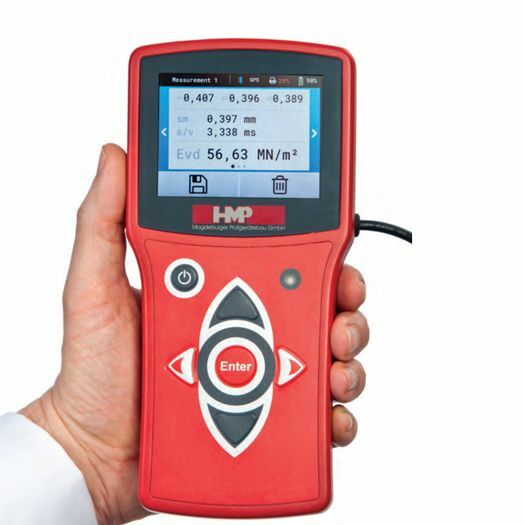 Point window – enter specific data for this measurement point. This data will be printed in protocol. Calculation of statistical parameter for several test points after entering of a minimum quantil. Print graphics Printing of data and graphics of one measurement point. Select the measurement point by entering the number in input field or by pressing the arrow keys in the upper area of programmme window. Print chart and chart with Ev2: If only special measuring series should be printed out, mark these series in Reading data index before print start.